Is it snowing in Snow Valley ?Thank you! 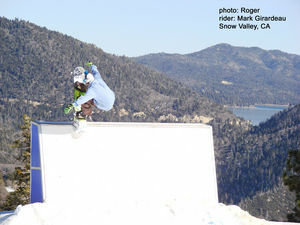 Snow Valley is the closest ski area to the valley floor, just five miles east of Running Springs on Highway 18, 30 minutes closer than Big Bear Lake resorts. With 13 lifts and 240 acres of powdery terrain, Snow Valley has something for every level of skier and boarder. Schighridj (pronounced 'sky ridge') Terrain Park offers more than a mile of downhill fun with numerous hits, spines, and tabletops. A quick glance at the trail map shows Snow Valley featuring a wide variety of skiable and ridable trails and terrain. A favourite of skiers and boarders of all ages, Snow Valley has enjoyed more than 60 years as a celebrated winter resort. No on-site overnight guest facilities are available but there are more than 400 rooms ranging from motels to hotels to Bed and Breakfast establishments in nearby Running Springs and Lake Arrowhead. Snow Valley is known to have shorter lift lines, a family friendly atmosphere and it is the first mountain people pass by before Bear and Summit. It is the mountain's best kept secret.